Knowledge about short-term climate change adaptation strategies for Mediterranean vineyards is needed in order to improve grapevine physiology and yield-quality attributes. We investigated effects of kaolin-particle film suspension on water relations, photosynthesis and oxidative stress of field-grown grapevines in the Douro region (northern Portugal) in 2012 and 2013. Kaolin suspension decreased leaf temperature by 18% and increased leaf water potential (up to 40.7% in 2013). Maximum photochemical quantum efficiency of PSII was higher and the minimal chlorophyll fluorescence was lower in the plants sprayed by kaolin. 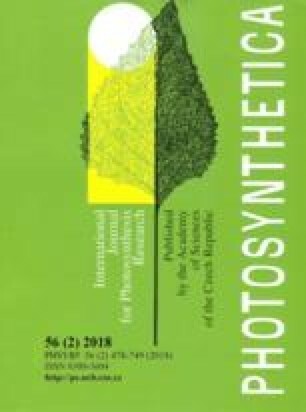 Two months after application, net photosynthesis and stomatal conductance at midday increased by 58.7 and 28.4%, respectively, in treated plants. In the same period, kaolin treatment increased photochemical reflectance, photosynthetic pigments, soluble proteins, soluble sugars, and starch concentrations, while decreased total phenols and thiobarbituric acid-reactive substances. Kaolin application can be an operational tool to alleviate summer stresses, which ameliorates grapevine physiology and consequently leads to a higher yield. Acknowledgements: The study was undertaken under the IC&DT INTERACT project–“Integrated Research in Environment, Agro- Chain and Technology”, no. NORTE-01-0145-FEDER-000017, in its line of research entitled VitalityWINE, co-financed by the European Regional Development Fund (ERDF) through NORTE 2020 and Award “Fundação Maria Rosa” to our team. The postdoctoral fellowships awarded to L.-T. Dinis (SFRH/BPD/84676/2012), A. Luzio (BPD/INTERACT/VITALITYWINE/184/2016), and G. Pinto (SFR/BPD/101669/2014) are appreciated. We would also like to thank to “Quinta do Vallado” for the collaboration and efforts in making the vineyard’s facilities available for the research and particularly to António Pinto and Daniel Gomes and BASF for collaboration. Supplementary material is available for this article at https://doi.org/10.1007/s11099-017-0714-3 and is accessible for authorized users.